MODERN SPACIOUS MOUNTAIN RETREAT ! GREAT FOR FAMILIES & MULTIPLE FAMILIES ! ! 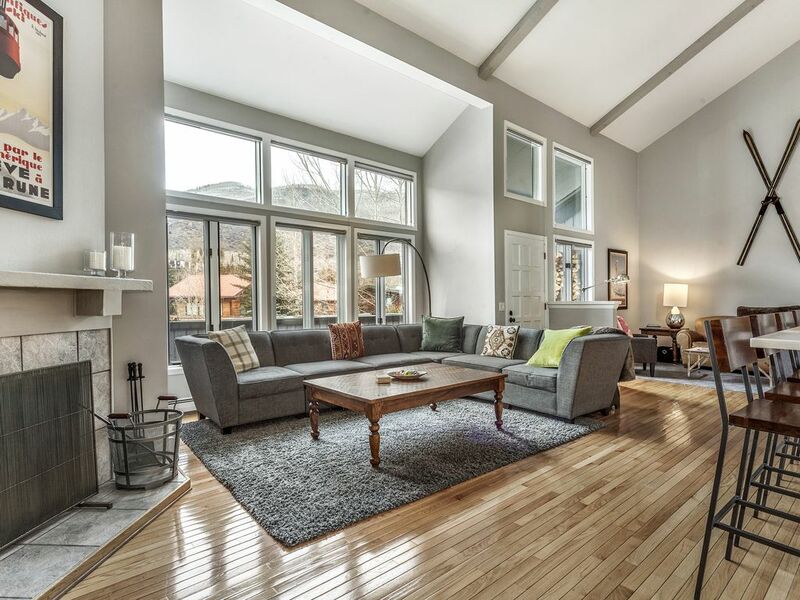 Enjoy this spacious 3000 square foot, contemporary mountain getaway. It has been completely renovated this spring. Our home is is an open, and comfortable 4 bedroom non-smoking, Townhome located in beautiful Matterhorn Village. This family owned, vacation townhome is not part of a rental pool and is used primarily as our second home. You deal with the owners directly, not an uncaring rental agency. We are located 1 minute from the Vail bus stop. You really do not need to drive when you get to our place. The lifts, food shopping, West Vail restaurants and Vail Village are only five minutes away via the bus or your car. You can also walk or bike into Vail Village along the beautiful 3.5 mile path that runs along beautiful Gore Creek. We are a stone's throw from Donovan Park, bike trails, hiking trails and beautiful Gore Creek. Our home is newly renovated and fully furnished with furnishings to sleep 10 people very comfortably. Sleeping arrangements include: The Master bedroom has a King bed with a brand new Master Bath with Steam Shower. Bedroom two has a Queen bed and its own private full bath. Bedroom three has a Full and an additional twin bed. The front deck offers amazing views of the Vail Valley. The Hot Tub located on the back deck is a great way to relax after a hard day of skiing, biking, hiking or fishing! The Basement has two bunk beds, a flat screen, a Wii Video System and a pull out Sofa sleeper. This is the ultimate kid zone ! There is a garage and great entry mud room which is great in all season for gearing up and gearing down before and after all of your activities. Our Registered Short Term Rental with the Town of Vail is # 000396. Alpine and Nordic skiing, ice skating, hiking, biking, golf, fly fishing, and tennis are all nearby and easily accessible. Love to ski, fish, play tennis, golf, bike and hike ! Love to ski, fish, golf, play tennis and hike ! We love the Vail Valley in Spring, Summer, Fall or Winter ! There is so much to do no matter when you are here. Great location in the heart of the Vail Valley !! Totally updated, kids zone in basement, garage to store your toys, flat screen tvs, stocked kitchen and great furniture.This is our second home and it is not rented that often- you will enjoy all of our comforts as if it were yours. Expanded Cable, WIFI, 3 Flat Screen Color TV's, Videos, Toaster Oven, Spices, UTENSILS- IT IS ALL HERE FOR YOU !! Our two families stayed at the home in early March 2019. The home fit the 8 of us perfectly and the kids basically lived in their own space downstairs. The proximity to the mountain only required a quick 2 stop shuttle ride. 12" of snow fell one day and provided us all with the best skiing of our lives. We hope to visit again someday. Scott and Jane’s townhouse was perfect. Very convenient West Vail location. Easily drive to Lionshead parking garage to ski for the day. Townhouse was beautiful, well equipped. Plenty of room for family of 8. Hot tub was perfect for apres ski!!!! Vail bus line very close and convenient. Thank you Doug. We are so happy you had a great stay ! Keep us in mind in the future! Amazing place to stay in Vail! We stayed in this property for Memorial Day Weekend and it was all we can wish for in a ski townhome. As described, it is very spacious and it has everything you need to have a good time in the mountain. We did not need a car since it is very close to the bus stop which is free and takes you to Vail Village or Lionshead. What we liked the most was all the details and amenities which were included with the place. Highly recommended, will stay again for sure. Thank you Armando ! Hope to see you again ! The house has been recently remodeled and updated very nicely. The high ceilings and open floor plan make this a great family house with plenty of room for the kids and adults. The downstairs bunk room is perfect for the kids and includes a big TV and Wii. The back deck includes a large hot tub and the front deck includes a gas grill both of which worked flawlessly during our recent stay. The free Vail bus is an easy 200yd walk away and takes you to Lionshead in 10 minutes. The bus works great and we used it daily during our ski week. The beds were very comfortable and plenty of hot water for the showers. A great place to stay if you are traveling to Vail. Highly recommended! Spacious living, updated kitchen and baths. No detail missing. Will definitely stay again!